DEMA was developed by Patrick Mulloy and first appeared in the February 1994 Technical Analysis of Stocks & Commodities magazine. 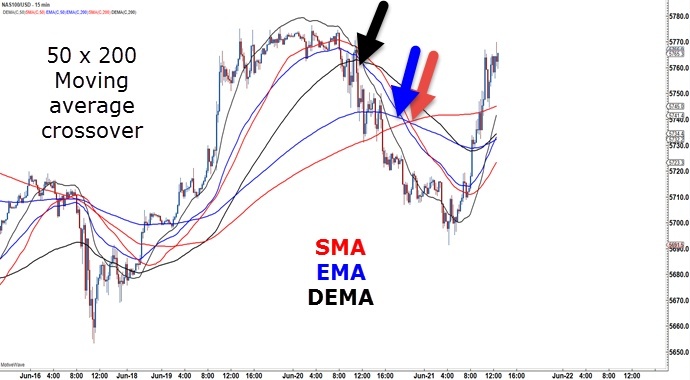 DEMA combines a smoothed EMA with a single EMA to provide a diminished amount of delays (than if the two moving averages had been used apart). DEMA stands for Double Exponential Moving Average, and is a calculation based on both a single exponential moving average and a double exponential moving average. In general, the EMA gives more weight to recent price data than the SMA. This implies that the EMA will follow the more recent price action more closely than the SMA. The more reactive, the quicker the change in trend. The main purpose of the moving average is to smooth out the price fluctuations and reduce the noise to a certain extent so that the trend becomes clear. However, smoothing creates a lag which results in later signals. DEMA allows achieving a smaller lag for the same amount of smoothing. In the NAS100 hourly chart below, the SMA is plotted in red, the EMA in blue, and the DEMA in black. Take note of how the DEMA follows price more closely than the EMA and SMA. Also, the DEMA turns first with the trend (less lag), followed by the EMA and SMA. NAS100 Example 1: The 15-minute chart below used for daytrading compares the smoothness and lag of the SMA, EMA and DEMA for a 50 x 200 moving average crossover system. As expected, the DEMA crosses first, followed by the EMA and the SMA. The latter two really lag, but the DEMA provides a sell signal close to the reversal point. DEMA will also show more reversal signals in a moving average system, which is why it should be combined with additional analysis so that it can be used as a market trigger based on other confirming analysis such as Elliott waves, Fibonacci or price action and candlestick analysis. 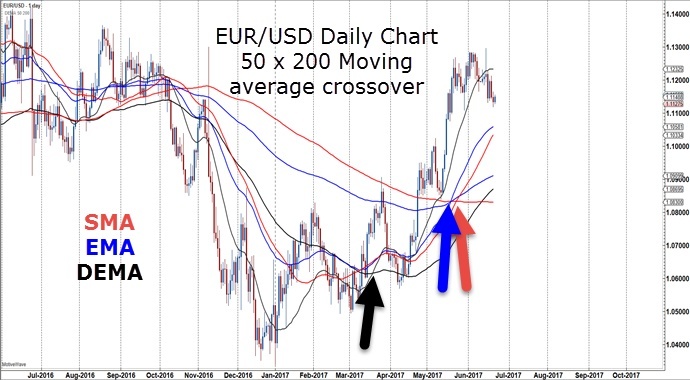 EUR/USD Example 2: The EUR/USD Daily chart below shows the 50 x 200 moving average crossover with the SMA in red, the EMA in blue, and the DEMA in black. One can readily see that the DEMA produced the earliest buy signal for the change in trend, followed by the EMA and then the SMA. The DEMA works well to identify early trend changes and to trigger early entries. During sideways choppy markets, the DEMA will also turn first, but as long as the trader is aware that the market is in a period of consolidation, they will look to ignore all moving average crossovers during the sideways market cycles. 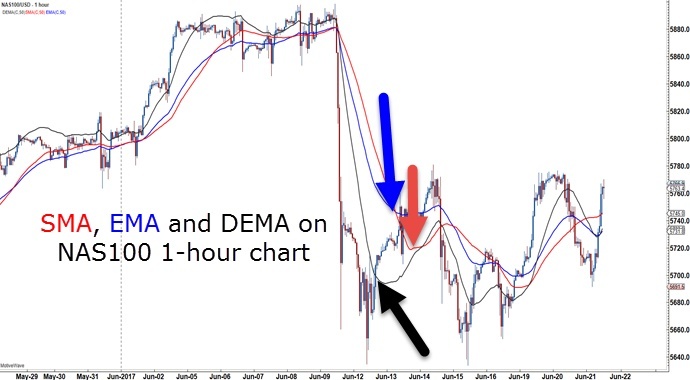 Learn how the DEMA helps keep traders in the trend longer, also alerting traders when the market is sideways. Start incorporating the DEMA into your chart set-up. Finally, use the DEMA in developing trading strategies. This entry was posted in Trading Tips and tagged forex trading online, IDEMA, Indicator Toolbox – DEMA, swing trading, trading, trading plan, trading strategy, trading system.